Long ago, the Buddha was born as a little parrot in the forest. One day a fire broke out in the forest. All the animals living there started running to the safe place to save their life. The parrot was also flying away to the river. He saw a great crisis there that many animals were unable to go out easily. An idea came into his mind. He wanted to help them to save their life. He dived into the water of a river and flew back over the burning forest. When he was over the forest, he shook his wings and a few drops of water fell down over the fire. The little parrot continued his work again and again. His wings got burnt. His legs were also slightly burnt. He was badly affected but still he kept continuing his work. Some gods were watching this event from the sky. They saw the parrot and ridiculed his work. And they laughed at him. But one of the gods decided to help the parrot. He changed himself into a golden eagle. He advised the parrot to save his life and not to do that job. The parrot replied that he did not need his advice, but he really needed help. The god wanted to help with his special power. He felt uneasy because other gods were enjoying watching the animals in crisis. Being kind to the animals he wanted to rescue (बचाउनु) them. He began to weep. Streams of tears came out of his eyes. The fire was put out (निभाईयो). Soon the fire and smoke disappeared. Wonderfully, the tears provided new life to everything. The parrot was shining with colorful feathers. All the animals were surprised and they become happy. Their brave friend parrot flew high in the sky. They shouted with joy. 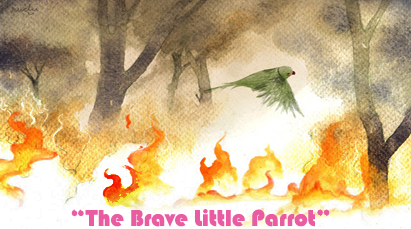 ⇒ Translation Of 'The Brave Little Parrot' is provided on comment box below. Happy days! Word Meanings In Nepali Of "The Brave Little Parrot"
Nepali Word Meanings of "The Brave Little Parrot"
1. Literal Comprehension: Once upon a time, Buddha was born as a little parrot in a forest. One day a fire broke out in the forest. All the animals there started running to the safe place. The parrot was also flying to the river. On the way, he saw that many animals being unable to go out to the safe area. Suddenly, an idea came into his mind. He wanted to save them. He dived into the river and flew back over the burning forest. When he was over the forest, he shook his wings and flew over the forest. A few small drops of water fell down and they soon disappeared. But the little parrot went on flying towards the river and back over the forest again and again. His feet became black by burning. His legs were slightly burnt. His lungs ached. His eyes were red. But still he went on. At the same time some gods were watching all this from their places in the sky. They said that the foolish bird was trying to put out the burning fire of the forest with a few drops of water, and they laughed. But one of the gods was worried and came to the parrot, changing himself into a golden eagle. He advised to parrot to save his life. Then the parrot replied that he did not need his advice. Suddenly the god realized his special power. He felt sad because the other gods were laughing and talking although the animals were trying to live. Like that brave little parrot, he wanted to help them. He began to weep bitterly. Streams of tears came rolling down his eyes. They were like cooling rain upon the fire. The flames died down and the smoke began to be clear. Wonderfully, the tears gave new life to everything. Trees and grass became fresh with green leaves. The parrot was shining with red, green and yellow feathers. All the animals were surprised. They were whole and well. Their brave friend was high in the clear blue sky. They shouted of joy for their friend and for the wonderful life rain. 2. Interpretation: The narrator is trying to tell us that one should think better and do better and for the sake of others. We should do our duty at any cost for betterment. The parrot was doing his duty to save the burning animals. He was not worried whether he would be successful or not. This story also tells us that the powerful ones laugh at the trouble of others instead of helping them. Only the person who has kind heart and suffered knows what suffering really is. The parrot living there knows it and therefore he helps them. It gives a clear message for all ages for humanity. Help and good deeds of others are great virtue and prime duty of all living beings. 3. Critical Thinking: This is the age of Science and Technology. Very few people today are so kind and helpful. Today people put forward a lot of questions about the existence of god. They do not believe on such things but it has become necessary to give the moral education and teach the value of human duty and virtue (राम्रो गुण). Can a man be reborn as a parrot or a god as an eagle ? Are gods out there ? Is it possible for a bird or an animal to speak like a human being ? Can the teardrops flow like a stream and put out the fire in the forest ? It is very difficult for us to accept such things. But it gives us a message of good deed and help to others. 4. Assimilation: This idea of the story has touched my heart. While reading the story I compared myself with the brave little parrot. I was also willing to put out the fire and help the animals. I also realized that everyone becomes selfish to some extent, but the great persons do not remain selfish all the time. I come to feel that we should sacrifice for the sake of other creatures. It memorised me the value of hard work and determination. Therefore, nothing is impossible to a firm, determined and hard-working person. Summary Of "The Brave Little Parrot"
Translation In Nepali Of "The Brave Little Parrot"
Four Levels Of "The Brave Little Parrot"
WordMeanings In Nepali Of "The Brave Little Parrot"
2 Responses to "The Brave Little Parrot | Summary | WordMeanings | Four Levels"
ती मध्य एउटा देवता अचम्म लाग्ने गरी विचलित भएर सुनौलो चिलको रुप धारण गरी तल उड्दै सानो सुगाको अग्नि मार्गतिर आए। पग्लेको सुन जस्ता आँखा भएको ठूलो चिल सानो सुगाको छेउमा आउँदा ऊ ज्वालाको ठीक नजिक पुग्यो। "जाऊ, सानो चरा !" गम्भीर एवं गर्विलो स्वरमा चिलले भन्यो। "तिम्रो काम निराशाजनक छ। ज्यादै ढिला हुनुभन्दा अगावै आफूलाई रोक र आफ्नो ज्यान बचाऊ।"
तर सानो सुगाले ज्वाला र धुवाँको बीचबाट उडान गरिनै राख्यो। आगोको रापले झन् झन् डरलाग्दो भएपछी आफू माथि उडेको ठूलो चिलको आवाज सुन्यो "पर्ख, मूर्ख सानो सुगा ! आफ्नो ज्यान जोगाऊ ! आफ्नो ज्यान बचाऊ ! खोक्दै सुगाले भन्यो, "त्यस्तो सल्लाह दिन मलाई ठूलो चिलको आवश्यकता परेको छैन। प्यारो चरा, मेरी आफ्नी आमाले यस्तो कुरा धेरै पहिले नै गरिसक्नुहुन्थ्यो होला। सल्लाह (खोक्दै), मलाई सल्लाह चाहिंदैन। मलाई खाली (खोक्दै) कोही मद्दत गर्ने भए पुग्छ। "
बल्ल हाँगाबाट चिलको आँशु तपतप चुहियो। आगोले पोलेको जमिनबाट धुवाँ माथितिर गयो। चमत्कारपूर्ण ढङ्गले जहाँ जहाँ ती आँशु टल्केका थिए, त्यहाँ नयाँ जीवन प्रस्फुटित भयो, नयाँ पालुवा, डाँठ र पातहरु पलाए। अझै पनि रातो देखिने भुग्रोको बीचबाट हरियो घाँस उम्रियो। आँशुको थोपा टल्केको सुगाको पखेटामा अब नयाँ प्वाँख उम्रियो। राता प्वाँख, हरियो प्वाँख, पहेँला प्वाँख, यति उज्यालो रङ्ग। यस्तो राम्रो चरा ! 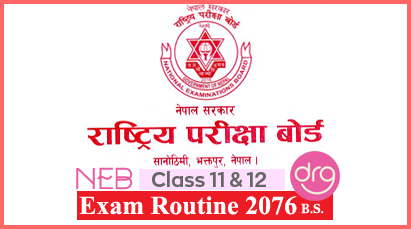 सम्पूर्ण जनावर चकित भएर एक अर्कालाई नियाल्न थाले। ती सबै सिङ्गै र सन्चै थिए। कसैलाई पनि केही क्षति भएन। माथि नीलो स्वच्छ आकाशमा उनीहरुले आफ्नो बहादुर मित्र, सानो सुगालाई आनन्दले उड्दै गरेको देखे। सबै खालका आशा मरिसक्यो पनि कुनै उपायले उसले तिनीहरुलाई उसले बचायो। "जय !" उनीहरु कराए। "बहादुर सानो सुगा र चमत्कारिक बर्षको जय !"